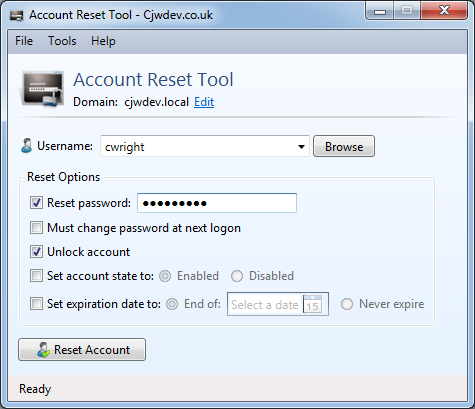 A new version of the popular Active Directory Account Reset Tool has now been released, adding some commonly requested features as explained below. Changes in this update have all come from user suggestions, so thanks for the feedback and feel free to keep sending in suggestions for ways this simple tool could be improved. Added a Browse button that allows you to search for users by their name (surname, display name etc) rather than only by username. Should the “Only Load User Names From OU” omit users accounts outside of the targeted OU from being enumerated when using the Browse button. Currently, I can browse any user that is outside of the specified OU. Curious is this is by design. Great Admin tool! Yes that is how it is meant to work, as the username pre-load is only there for convenience and limiting it to a certain OU is not meant to act as any kind of security. If you do not want your users to be able to modify users outside of a certain OU then you need to use permissions in Active Directory to restrict this rather than relying on this tool to just not show them (as there’s nothing stopping the user using some other tool/script to modify the users outside of that OU even if our tool does not show them).